Mini-scenic items, from 40k 3rd Edition | Azazel's Bitz Box. Last night and today I did these. Gluing and so forth yesterday and painting today. 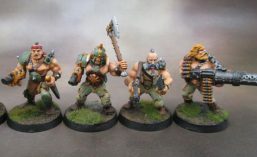 Mostly because I found them in a little baggie, and decided it would be nice to just get something done from start to finish, even something as simple as these, which it turns out are from the 40k 3rd edition starter boxed set. So I’ve had them since 1998, or 17 years. Oh. Apparently I’ve lost one of the little bits, as I only had the three when I should have had 2 of each. I must have just shoved them to one side and forgot about them until whenever I was sorting through stuff and chucked them into a zip-lock. I might have decided to save them to incorporate them into something more grand, which clearly never eventuated. Whevever. Now they’re done and have been added to my collection of little bits of scatter terrain. 40k 3rd Edition ruined bits. Sprayed black, a mixture of cat litter and coarse sand applied. Painted black again. Drybrushed through VMC Black Grey, Basalt Grey and then VGC Bonewhite. Varying shades of weathering powders added for colour, and then another Bonewhite drybrush on top. Matt varnish, done! The technique isn’t especially interesting, and I’m only writing it down here so I’ve got a record of it in case I find more of these little blighters and want to keep it consistent. Dark Angels stalk through the ruins. 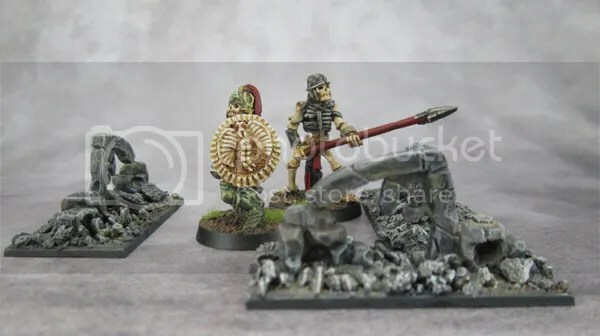 Undead warriors lurch through the shell of a ruined building. I was going to add some static flock to them at first, but decided against it for the same reason I avoided doing so on the Citadel Craters I painted a year ago. I’d like these small bits of ruins to be of indeterminate age. 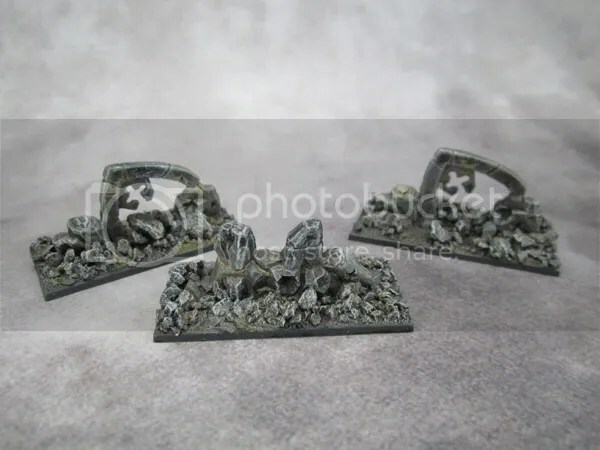 I want to be able to use them in a game of Bolt Action or 40k to represent a building that was shelled by artillery that very morning, as well as to use them to represent a small corner of a town like Frostgrave, or Osgilliath, or any generic place in most any climate. Adding grass instantly means it’s been there for awhile, which I wanted to avoid. They’re a little smaller than I’d like, but they’re decent. More of an obstacle to movement than something that provides any cover, as the pictures-for-scale shots show. 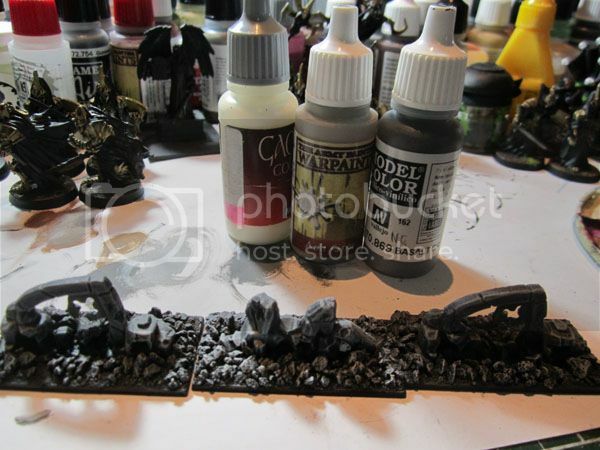 This entry was posted in Wargame Scenery and tagged 40k Ruins. Bookmark the permalink. Oh these turned out really nice! I actually love the arches that look like they’ve fallen from a tower or monument of some sort. And may I ask – the Vallejo and Kromlech pigments/powders: What are they like? And how are they used? Thanks! Nice simple little bits that I finally got started (and finished). Kitty litter makes for great debris. Much better than the ground-up sprue I see a lot of people recommend, except for when you want some girders, obviously. And the price is right! Using pigments.. that’s a pretty big topic, as they can be used in many different ways – to stain, or create wet or dry mud and dirt effects, to add “dust“. Here, I’ve just used them to “stain” the rubble, which is about as simple as you can get with them. Without being a cop-out, I’d recommend YouTubing some tutorials to see what you can do with the stuff, as there’s a pretty wide variety of ways to use them and to “fix” them to the painted model. See what inspires you. I’m glad you put figures in for scale – at first I was thinking they were a lot larger! They are very nice pieces suitable for fantasy, modern or future settings. They do look good! Nice and simple to assemble and paint. Just what you need sometimes. Thanks for showing these mate, and sorry life hasn’t been playing nice – I hope all turns out well on the health front! Pingback: Azazel’s Bits Box: 2015: The Year in Review | Azazel's Bitz Box.